Asparagus is my favorite vegetable, after artichokes. Whenever I see it on sale, I go for it, as it is one of the more expensive veggies. Now. When I get my fresh bunch of asparagus home, this is what I do. First comes the asparagus risotto, using only the tips and parts of the stalk nearest the tips. After that you have the problem of what to do with the rest of it. In my experience, a good rule of thumb is that if you can still easily break off pieces of the stalk with your hands, it's still tender and edible. So I took the remaining stalks left over from my risotto of the other day. Broke them into pieces slightly less than an inch (about two centimeters, for the furriners out there). Any bits that were resistant to breaking I threw out. In the morning, I had already put out four eggs, as I make frittata and omelette with eggs at room temperature. This is not absolutely necessary, but I do it. I preheated my broiler, because I come from the school of those who broil the top of the frittata rather than flippin' it. Now. I microwave my asparagus. That's right. Put the bits into the ole microwave at one-minute increments and zap 'em. They should retain their vivid green color and pleasant grassy smell, or else you've gone too far. Move 'em around in between zappin' to cook evenly. If you're feeling particularly insecure that day, make it 30-second increments. Have a knife with a sharp point to test for tenderness. Thinly slice one fourth of an onion. Now you've got your asparagus and onion. Get a medium-sized non-stick pan. Cover with olive oil and heat. Beat your eggs with salt and freshly ground pepper, add a small splash of milk if desired. Lightly saute' the onion in the olive oil; do not brown. 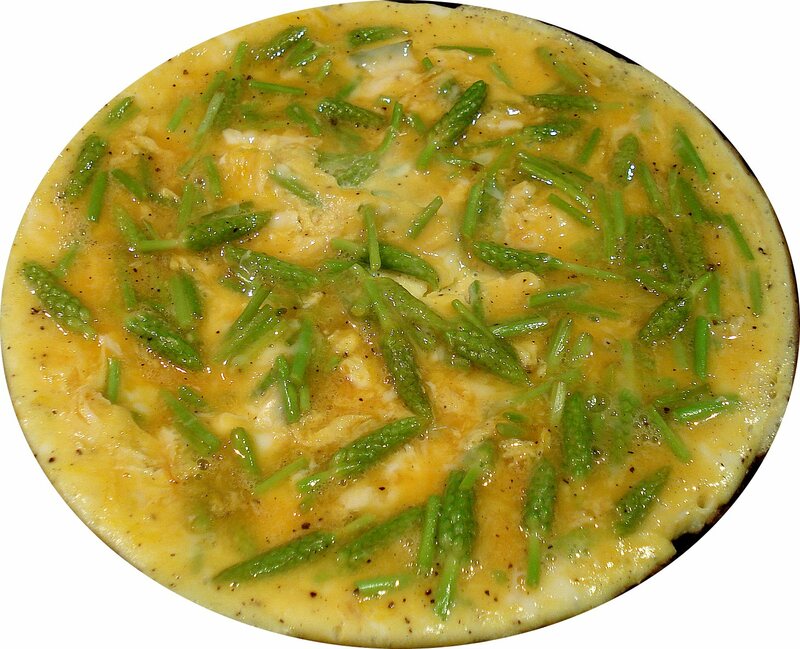 Mix in asparagus with eggs, drop into hot pan. Add freshly grated parmesan and fresh minced parsley (optional); swirl to cover pan and cook evenly. When almost set, manually place under broiler to cook top. Do not forget that frittata can be eaten warm or at room temperture. Frittata, like Spanish tortilla, is cut into wedges and can be eaten as a snack or even in a sandwich with crunchy bread.